More than 35,000 students and guests attended last year's Commencement ceremony, held for the first time at AT&T Park. This year's event will take place on May 27. 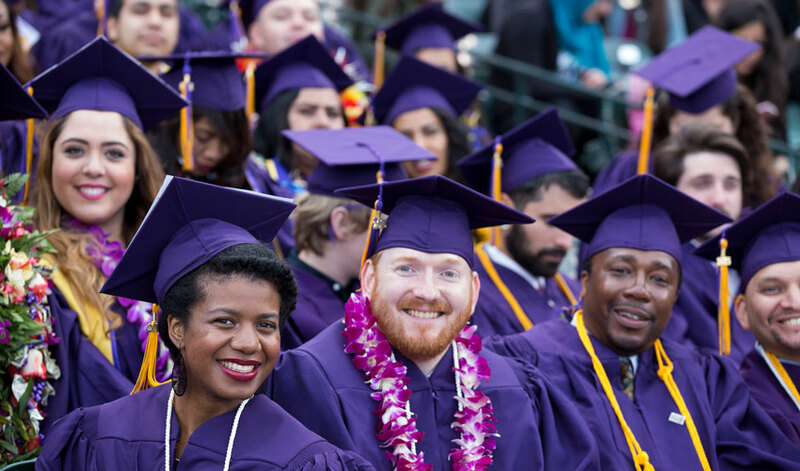 San Francisco State University's 115th Commencement ceremony will be held on Friday, May 27 at AT&T Park. More than 8,000 undergraduate and graduate students will receive their degrees at the waterfront ballpark, with more than 35,000 guests expected to attend. Oscar-winning film producer and SF State alum Jonas Rivera (B.A., '96) will deliver the Commencement address. Claudia Corona and Richard Polote, two of 12 students who have the honor of wearing their college's academic hood at Commencement, will be the student speakers. Honorary doctorate degrees will be awarded to: Bob Linscheid, former president of the San Francisco Chamber of Commerce and former chair of the California State University (CSU) Board of Trustees; Jeffrey Mallett, entrepreneur and one of the founding members of Yahoo; and Charlotte Mailliard Shultz, chief of protocol for the city of San Francisco. Shultz's husband, former Secretary of State George P. Shultz, will be awarded The President's Medal, the highest honor bestowed by SF State President Les Wong. The award acknowledges those who have made long-lasting, widespread contributions to the University and their community. Past medal awardees include Senator Dianne Feinstein and former San Francisco Mayor Willie L. Brown Jr. (B.A., '55). AT&T Park will once again host SF State's Commencement in 2016. AT&T Park will open to guests at 3 p.m., the procession of students will begin at 5:30 p.m. and the ceremony will start at 6:30 p.m. and is expected to last 2-3 hours. A fireworks display will conclude the event. Additional information about Commencement is available at commencement.sfsu.edu. Live updates and photos from the ceremony will be posted to the University's Twitter, Instagram and Facebook accounts. Graduates and guests can tag their Commencement posts on social media using the hashtag #SFSU2016. This year, a new Commencement app will keep graduates and guests plugged in to the latest news and events leading up to Commencement. Visit www.eventmobi.com/sfsucommencement2016 to view and download the app. Oscar-winning film producer and SF State alum (B.A., '96) Jonas Rivera joined Pixar Animation Studios as a production office intern in 1994 to work on the company’s first feature film, "Toy Story", and has since worked on almost every Pixar feature film to date. In February 2016, he won his first Academy Award as the producer of Disney/Pixar’s "Inside Out" in the Best Animated Feature Film category. Richard Polote is a decorated U.S. Air Force veteran who will receive his bachelor's degree in Africana studies. At SF State, he found a passion for community service and has served as a mentor to incarcerated youth through San Francisco's Youth Justice Institute, where he's been recognized as Mentor of the Year. He also volunteers at the Afrikatown Community Garden at Qilombo Community Center in Oakland, in addition to serving as a Boys & Girls Club youth development coordinator. Polote plans to pursue a master's degree in Africana studies and journalism and is currently working on a documentary film about the lynching of African American men in the Southern U.S. since 2000. Claudia Corona became the first in her family to earn a college degree as an undergrad at Williams College in Massachusetts, and will next receive her SF State master's degree in geosciences. At SF State, she worked on a project that was the first to demonstrate a relationship between climate variability and groundwater. Outside the classroom, she volunteers with SF State's Sol Patch Garden, plays on the women's rugby team and volunteers with organizations that bring science into elementary school classrooms. After graduation, she will continue her SF State-based research before beginning doctoral studies, with a goal of becoming a water resource expert who can help California battle the drought and the impact of climate change on groundwater resources. Learn what to expect at this year's Commencement by reading these frequently asked questions. Read a Commencement message from President Les Wong. Get details about what to expect at AT&T Park. Understand the guest ticket policy.